I hope you all had a wonderful Easter and weekend! Working in marketing doesn't leave me with a ton of days off, but fortunately we got Friday off, which made for a wonderful (and much-needed) long weekend filled with house-hunting (eek!) and family time. This is a super easy and classic look that works really well for a casual workplace, weekend lunch, etc. Blue and white are such a crisp pairing and I always gravitate toward blue tops when I wear these jeans. I hope your work or school week is off to a great start! Your Easter outfit was so pretty- I love the skirt! totally gorgeous and i love ur easter pic at the end! hope u had a blessed day! You are so adorable Jacy! Loving how this casual outfit still looks so chic and put together! Good luck with house hunting! Apartment hunting was super stressful so I can only imagine how much worse house hunting would be. You look great and so polished in your outfit! Good luck house hunting and it is so worth the sacrifice. Love this everyday look, so perfect for work. I'm obsessed with this bag! Love what a simple, classic look this is. It's adorable and perfect for spring. Loving the classic elements! I need to get some flats like that. Hope you had a great Easter J. Good luck with the house hunting too! Love that shirt and loving all those lovely camel tones paired with this outfit. Perfection! I love those crisp white pants! So lovely with the blue stripes. I'm glad you got some time off and good luck with the house hunting! What a gorgeous laid back chic look! Hope you found the house of your dreams! 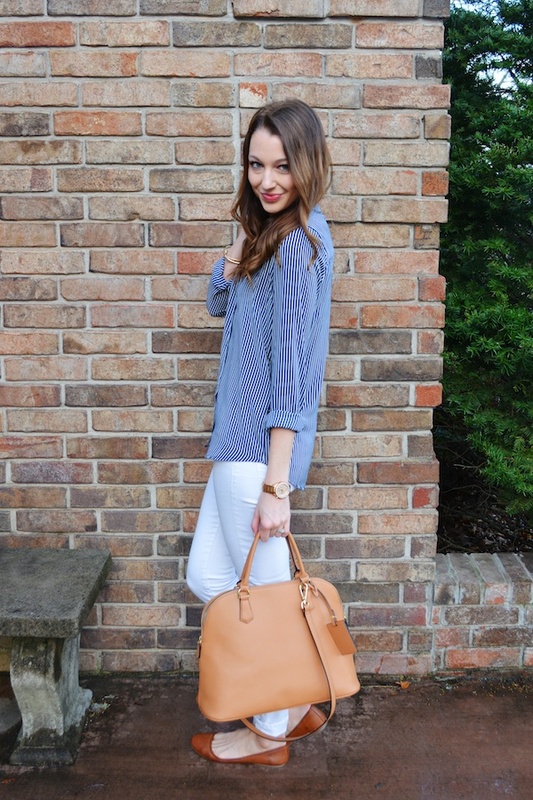 this striped top is adorable, and I'm a fan of any look with white denim! Oh no! I definitely know how that is. We didn't know what school we'd be at either until a couple of weeks ago, so that pushed us back a bit. I hope you guys know soon though so you'll have some time to look! Oh no, how rude! Although I was actually surprised we got the day off, because that's exceptionally rare in advertising haha. Glad you had a great Easter weekend though, and thank you so much! !